If you haven’t yet added guava fruit or juice to your grocery list, now might be a good time to do so. Guavas have a number of important health benefits going for them. For one, guava contains a carotenoid called lycopene. You may have heard of lycopene in relation to tomato products. Lycopene is important for your health because it is a powerful antioxidant. Antioxidants help to fight the damage caused by free radicals. This kind of damage can lead to diseases like cancer. Guava is also high in fiber. Guava contains roughly nine grams of fiber per cup. That’s a pretty hefty amount and more that most fruits offer per serving. Fiber will help to keep your digestive system healthy. Fiber moves food through your stomach into the intestines, where wastes are efficiently eliminated. Fiber can also act as an appetite suppressant. When you eat a lot of fiber with your meals, you feel fuller for longer periods of time than you do when you eat simple carbs. And, finally, fiber can help to lower your cholesterol levels. 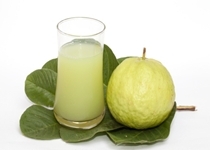 There is one other health benefit that you can gain from drinking guava juice that you might not know about. In Asia, guava is used to treat diabetes. It seems that guava has the ability to increase insulin concentration. In one animal study, guava was found to lower blood glucose levels in diabetic mice. This effect was repeated in human patients. Keeping the level of sugar, or glucose, in your blood as close to normal as possible is necessary for good health. Many complications can happen as a result of elevated blood glucose, some of them quite serious. Skin problems and many more. To get all the health benefits from guava, look for good quality fruits that are firm and free of bruises the next time you are at the grocery store. Ripe guavas should have a fragrant, fruity aroma. They can be stored at room temperature unless the fruit is very ripe, in which case you can refrigerate it.